Wallich Mussaenda is an erect shrub with thick branches. This species was reported from Great Nico- bar Island by Kurz in 1876. It was reported again in 2009, after a gap of more than 130 years. Leaves are elliptic-ovate to lanceshaped, usually abruptly or with a tail, tapering, hairless, nerves velvet-hairy; stipules long, gradually narrowed from the base, entire or bifid. Flowers are yellow with white petaloid sepal in lax flowered Cymes. Calyx teeth are half as long as ovary or longer, elongate. 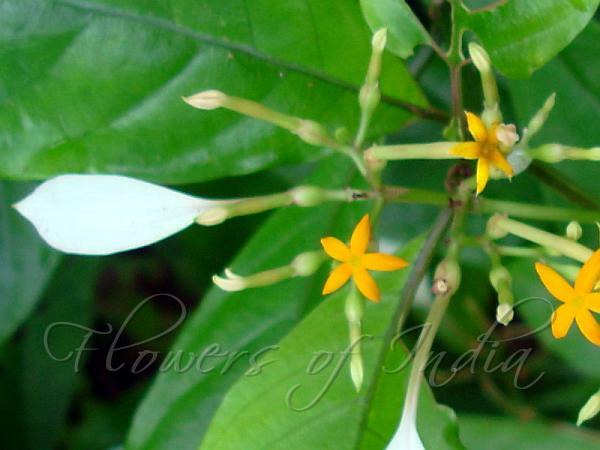 Flowers are hairless; tube slender, 2.5 cm long; petals narrow, finely tapering. Berries are nearly spherical with persistent calyx teeth. 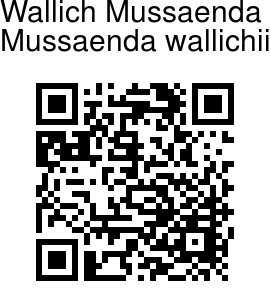 Wallich Mussaenda is found in Nicobar Islands and Myanmar. Flowering: May-June. Identification credit: Joju P. Alappatt Photographed in Great Nicobar Island, Andaman & Nicobar.